Jessica hates many of my off the wall analogies. I can’t tell you how many times she has asked me, “how did you even come up with that?” Trust me, I am the first to say that many of them are NOT gold, but I am pretty proud of a recent concept that I came up with to help explain why our DVRT Ultimate Sandbag workouts are so different, yet, so incredibly effective. I feel pretty good about this one because during the Question and Answer session of this past weekend’s Perform Better event some of the biggest names in the industry were writing it down. What?! 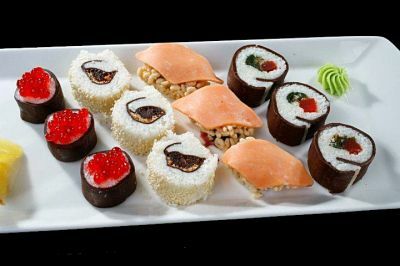 Chocolate sushi is my way of explaining how having a system, like what we do with our DVRT Ultimate Sandbag workouts, is different than how many people approach training. But what does it mean? A lot of people take an approach to fitness that I can’t blame them for thinking is a good idea. That is they will do EVERYTHING!!! All of us tend to realize that there are shortcomings in about every fitness program. We spend more time in DVRT Ultimate Sandbag workouts trying to ensure we have as little as possible than we do trying to create new exercises. Heck, that is even how we DO create new exercises and cues. What is chocolate sushi though??!!!! Okay, so I love chocolate, I love sushi, but putting together a spicy tuna roll and chocolate sounds disgusting to me (full transparency though, I’ve never actually tried it, I’m confident it is gross though). Just because we put two great things together doesn’t mean they create synergy and we get something even better. How does this relate to training though? Most people try to create chocolate sushi all the time. They believe by combining all the different methods, exercises, and tools together, they get something special and they never “miss out” on anything. In theory, this sounds like a rather sound plan. The problem arises when we realize that very often these methods are contradictory and trying to intermix them creates less success, not more. That is because we are dealing with physiology, not just parts of a puzzle. If being a great powerlifter built strength that transferred to more movement strength based activities like gymnastics, they would do it, but they don’t. If building muscle mass was the ideal way to get stronger lifting weights then Olympic lifters would use it, but they don’t. The point I am trying to make is that everything we do has a cost and benefit to it. In reality, the best programs are those that can minimize their costs and have their benefits so greatly help the individual that you don’t mind the costs. Our DVRT Ultimate Sandbag workouts are no different. In fact, it is hard to have people understand that we have a system. It shouldn’t be though. A training system is like a recipe, if you follow it, great things can happen. If you deviate and start throwing random things into it, the outcome is rarely a good one. Renowned fitness coach, Alwyn Cosgrove, had a great example this past weekend. He spoke of following a recipe to make cookies. We know if we get the dough, put them in the oven at 325 degrees for about 20 minutes, you can have delicious cookies. However, if you decide you want to throw some smoked salmon into the dough, put the temperature to 500 degrees, and set the timer for 5 minutes, things don’t work out so well. I’ll admit, having a training system is a unique thing in fitness, but it shouldn’t be. Our Ultimate Sandbag workouts are based simply on our DVRT training principles. A great example is one of the Ultimate Sandbag workouts that DVRT Master, Cory Cripe, ran this past weekend. If I just showed you this walking clean, you might think “cool, but way too hard for me!” However, if you realize it is built on a foundation of our hip bridge, these press outs, sprinter stance deadlifts, and more, you see how a system rather than a “hodge podge” (people still use that expression or am I REALLY dating myself?) is the real option to creating success in our workouts. As DVRT Master, Steve Holiner, demonstrates below, our Ultimate Sandbag workouts aren’t JUSt about using the Ultimate Sandbag. They are about using the DVRT principles to have cohesiveness in what we do in our training. It is THIS way we create synergy to our training and the results we REALLY want! See how DVRT Ultimate Sandbag workouts are redefining how we think about raining with our DVRT workout programs HERE for 30% off for one more day with coupon code “july”. If you want to get deeper into the DVRT system in our educational programs in Seattle, Boston, and New York, check them out HERE (coupon codes don’t apply to live events).